Seeing this season’s latest blockbuster may be the motivator to get people into movie theaters, but theater owners know the key to driving profits is increasing concession sales to customers before the show. Movie-goers have just seconds to make a decision, so the presentation of concession offerings must be attractive and enticing. Digital signage is paving the way as the next-generation technology in the cinema industry. Digitally enhanced menu boards in theaters generally consist of a number of LCD screens, ranging from 32 to 62 inches, and are driven by a robust software package. The technology is replacing traditional static menus because of its cost effectiveness, and the ability to attract attention and influence sales. Real-time changes, which are possible with digital menus, save significant time and cost over traditional static menus. With digital menus, once a design is approved, it can be pushed to theaters worldwide in minutes. Since changes require only a few clicks of the mouse, the food and beverage and marketing teams can test markets and tweak messaging without costly reprints and distribution expenses. In 2009, Cinemark Theatres, the second largest cinema chain in the world with 431 theaters in the United States and Latin America, turned to digital menu boards as a way to draw customers to their concessions and positively influence buying decisions. Cinemark has long embraced the power of marketing and technology and felt that digital menus were a natural progression in their long-term goals to stay in the forefront of the industry. Cinemark determined that digital signage would save money over time by eliminating the cost of printing and distributing static signs, as well as decreasing the man hours required to replace the static signage. Cinemark was looking for specific capabilities in the digital menu board supplier. “We needed a solution to control the on-screen design of each display, have the flexibility to schedule region-specific promotions and pricing, and consistently enhance our image and customers’ experience from coast to coast,“ said William Angles, director of design for Cinemark Theatres. Cinemark chose Texas Digital Systems, based in College Station, Texas, as the exclusive manufacturer and supplier of digital signage solutions for its theaters. 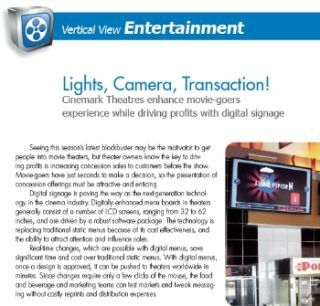 Their VitalCAST digital signage software was installed at more than 145 new build and retrofitted Cinemark locations throughout the United States and Canada during a six month roll-out in the second half of 2009. Additional locations have been added since the initial roll-out, with 230 theaters now installed nationwide. All menu information, including items offered, pricing, combo choices and promotional messaging, is controlled from Cinemark’s corporate office in Plano, Texas. VitalCAST interfaces with Cinemark’s in-house point-of-sale system at each theater to customize menus on a store-level basis for menu items and pricing. Each concession installation consists of multiple sets of three LCD screens mounted side by side. Theaters typically have between three and 16 LCD displays, depending on theater size and geographic location. Within each set, one screen displays the main concession offerings, such as popcorn, candy and nachos. Logo images for each soda flavor offered, which vary based on location, are automatically displayed based on the POS data. A small area on this center screen is devoted to video brand messaging, such as Coca-Cola. On the outer screens, Cinemark promotes its combos and promotional offerings with motion graphics and videos. This combination of information has proven to provide an aesthetically pleasing experience for theater-goers and an effective way for theater employees to cross-sell and up-sell the highest profit items. Additional features of the VitalCAST digital menus at Cinemark include the ability to deliver special pricing or menu items at certain times of the day or days of the week. The ad hoc capabilities even make it possible to develop one-time-use menus for special events and exclusive screenings. Due to the success of the digital menu board roll-out, Cinemark has expanded its use of digital signage at some theaters to include digital movie posters, box office displays and other signage, all driven by VitalCAST. Movie titles, show times, ratings and even small images of the movie posters are automatically generated from POS data, making the whole experience a hands-off task for the local theater. Digital signage at Cinemark Theatres has been well received by customers.